I am excited to announce something I have been hinting at on instagram all week long. To celebrate the holiday season and to thank all of you for supporting me all year long, today I am launching 12 days of giveaways! Happy holiday season everyone! For the next 12 days I will be posting here on the blog every single day (bring on the coffee lol). The posts will be the same as usual – outfit ideas, holiday gift guides, etc., but at the end of each post I will announce a new giveaway. The giveaways vary from big to small, from fashion to beauty, and from one step entry to a few steps. I am really excited about the holiday outfits I have for each of these next 12 days of giveaways – often the outfit or gift guide will be associated with that day’s giveaway – and I think you will be so excited about some of the goodies to be won. Come back to LegalLee Blonde everyday for the next 12 days so you don’t miss any fun content or giveaway prizes! Before I get to today’s giveaway one last thing! In case this hasn’t been enough to get you in the holiday mood (what do you need- a singing elf?!) I wanted to share with you this selection of holiday party clothes & accessories. I’ve found some really fun pieces here over the past two weeks – some of which you’ll see on the blog later this month. On to today’s giveaway! *happy dance* Today I am excited to be giving one lucky person a makeup prize pack valued at over $300! 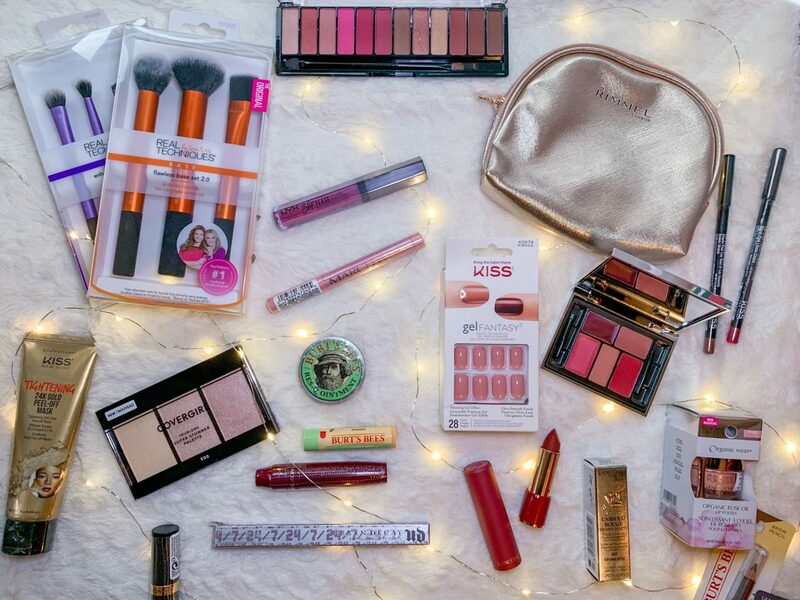 Included in this prize pack are products from the new winter collections by Urban Decay, Laura Mercier, Revlon, Burt’s Bees and more! I am really excited (and grateful) that I get to give all of this to one of you. Happy day 1 of 12 days of giveaways! Follow the instructions below to enter to win this makeup prize pack! Good luck! "What to Wear to a Black Tie Holiday Party"
"My Go-To Christmas Gift (12 Days of Giveaways – Day 2)"
Great giveaway!!! Can’t wait to see what’s next! I spy some of my faves, including Burts Bees and Kiss press-on nails, which I’ve loved for years. Thank you for the super fun giveaway!! Yass the burt’s bees products are some of my faves too! And you are so welcome! good luck!! Such a fun giveaway! Thanks for the chance! You’re so welcome! good luck! !